I was lucky enough, as an artist who adores drawing nudes, to recently have six girls pose naked for me in one sitting. The space was small and alcohol had been consumed, as you can imagine the scene was a little chaotic and the chances of keeping anybody still for the amount of time to capture an accurate representation of the scene before me were slim to naught. However an opportunity to represent the scenario arose in the form of a bubbly and determined Irish girl who goes by the name of Dervla who happened to be hosting what she called a 'Wild Art" Exhibition. Somehow, Dervla had managed to get her hands on a fairly large apartment and permission to paint on alllllll of the walls and she was recruiting artists to fill the space with both paintings and unique, temporary art. Naturally the Painters Palace was a solid point of call and a few of us got together and took over one room of the apartment. We each took our own section of wall and started painting a few days before the exhibition. I had the idea in mind of what style I wanted to implement to show the chaos, the movement, the intertwining limbs from that night with the English girls. I did not do any preliminary sketches, other than the drawings from the 90 minute session. Working in this style is a very impulsive and intuitive process, I find that trying to build the picture before you meet the canvas can intrude on an organic and spontaneous outcome. Therefore I dwell on the idea of the scenario/memory, what I found interesting, the conversations between the subjects (which were extremely fascinating), less on the real form or identities of the girls themselves but most importantly, thinking about the actual process of the painting, down to the brush strokes, in forms of movements that translate into marks that make the picture. Little moments of memory come to me as I create, like the side of a thigh running into the curve of the calf, the expression or tilt on ones face and it seems the as the moments come to me, I have to realise and compose them on the wall. As the exhibition was only intended to be one night I held back on refining every detail of the painting and rather looked for an overall harmony in the piece which ended up being roughly 4m wide and 2.4m tall. Big Thanks to Dervla and everybody that was involved with the event. It was a huge success with attendance around 700 over the space of 5 hours, which in my book is pretty funking incredible for a first time event! For more info on the exhibition, the artists and works involved plus upcoming events > check here. Below you can see the finished result, followed by the piece in context of the other works in the space, and then some shots of the process. As always, Enjoy. 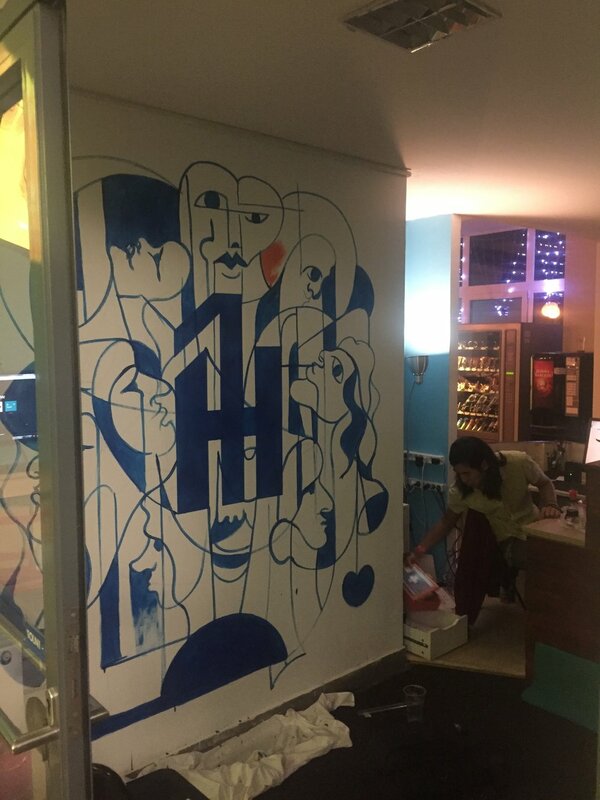 Recently the Painters Palace was asked to add some excitement and colour to the white walls of the newly renovated hostel. This was my contribution, right newt to the reception. I used some good quality acrylic paint and finished with markers. Overall I think the piece is about 2m by 2m.